Specific demands are placed on dish washing when the food served in the school is delivered from a central kitchen outside the school premises. 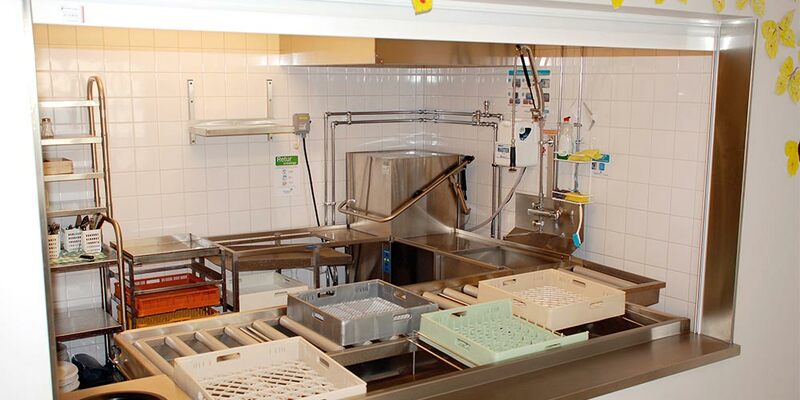 We help the school kitchen to create clean and optimal handling between the central kitchen, the school cafeteria and back to the central kitchen. Plates, glasses and cutlery are washed and kept in the school's kitchen facilities. Containers are emptied and cleaned before they are returned to the central kitchen where they washed yet again for hygienic reasons. Schools and central kitchens are welcome to contribute to sustainable environment by collecting the food waste. We offer Eco Waste Away, which grinds and transports in a closed system the food waste from the kitchen to a tank. The slurry is collected by a tanker and driven away to be converted into both fertilizers and environmentally friendly bio gas. Modern dishwashing consumes less water, leading to lower energy costs. Modern washing equipment uses thus less chemicals. The dishwashing contributes to lower costs and less environmental impact per meal served. If you are responsible for the school or the central kitchen, you are welcome to contact us. We want to show how a modern and energy efficient dish handling contributes to sustainable solutions.